Last time we laid out the basics of making sushi. Now, we're ready to get rollin'. Not that we're quite there yet. Making a good makizushi (a rolled up sushi with nori, or seaweed, on the outside) can take some practice, you might notice how ours isn't perfect either yet. Still, they are quicker and easier to make than nigirizushi (a 'clump' of sushi rice with a topping), so a good starting point. Previously, we gave a shout out to the Hokkaido restaurant of Ghent. Today, we'd like to direct you towards another favorite of ours. Sushi Point is sushi take away at it's best. It's pricing is a bit higher, but in return you get very creative rolls. Their chef went to study in an actual sushi school in Tokyo. When you order at the counter, you can watch him prepare the sushi as you wait. 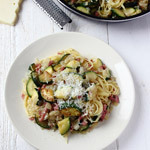 Today's recipe is inspired on one of theirs (as far as we could secretly deduce it). 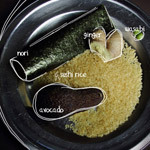 Prepare the sushi rice according to this base recipe. Cut the mango and salmon in long strips. Place a sheet of nori in front of you. Cover the sheet with a nice amount of rice. Leave about 1,5-2 cm / 0.5-0.8 inch open at the top. Spread some mayonnaise along the top edge of the roll. Drizzle a teaspoon of honey-chilli sauce over the length of the sushi. Do this at about 3 cm / 1 inch away from the bottom. Place long strips of mango and salmon on top of the sauce and finish off with the onions. Using the sushi mat, tightly roll the sushi away from you until you reach the other end of the nori. The mayonaise will help you seal the roll. Remove the rolled sushi and transfer to a cutting board, seam side down. Cut the roll in bite-size pieces using a very sharp knife. Inspired by a sushi roll from Sushi Point.